This weekend brings us another edition of the growing Tucson Comic-Con. If you’ve attended the con before than you probably know it’s a very creator heavy convention, focusing on local creators or as well as some national creators who specialize in the “indy” route in the comic industry. New this year at TCC are a few media guests that should help draw some more attendees that maybe are not into comic books or cosplay. 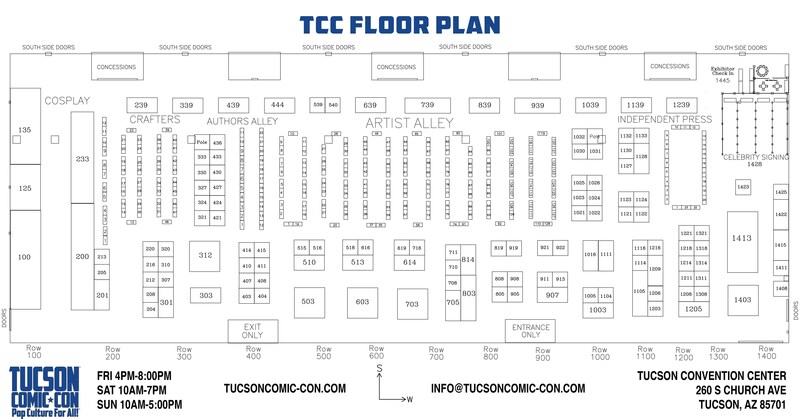 This guide should help inform you about the little details of Tucson Comic-Con! Tucson Comic-Con is a three day convention during November 4 – 6 at the Tucson Convention Center. For an adult weekend badge is $35, a kids (age 9 -13) weekend badge runs $10. It’s important to note if you order yours online through GrowTix, you will receive the Tucson Comic-Con membership benefits package which includes a few different perks such as a TCC lanyard and a mini art print. Individual days that can be purchased at the box office vary in price: Friday – $15, Saturday – $25, and Sunday – $15. Kids ages 8 and under are free, kids age 9 -13 are $5 a day. Need to know when you get pick up your badge? on Friday, registration is open from 2PM – 7PM, Saturday 8AM – 6PM, and Sunday 9AM – 4PM. My favorite part of Tucson Comic-Con is the wide variety of vendors and merchandise that can be found across the con. The hours for exhibit hall are as follows: Friday 4PM – 8PM, Saturday 10AM – 7PM, Sunday 10AM – 5PM. You can click on the above image to see the layout and you can click here for the list of artists and vendors. The convention center offers about 1000 parking spots and usually charges about $8-$10 for the day. I would recommend getting to the convention center early because open parking disappears quickly. There is also a paid parking lot that is roughly a 6 minute walk from the convention center that can be used as a back up plan. As always, make sure to follow Legion of Sand on Twitter for Arizona pop culture conventions updates, including Tucson Comic-Con.